If you know me, you know I love my bike. 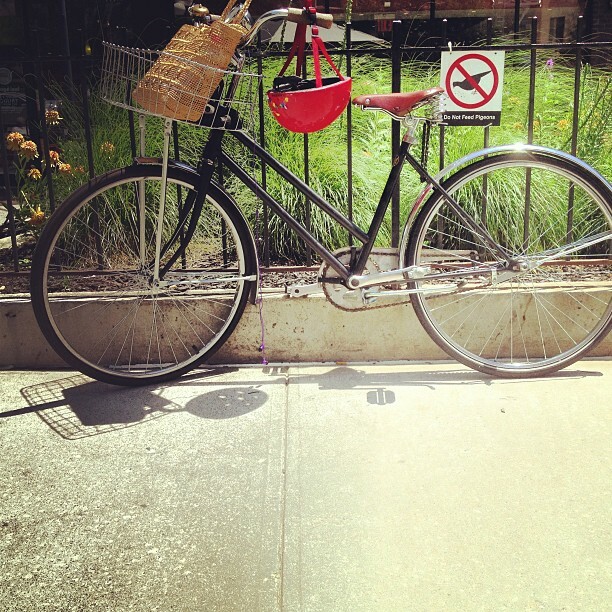 My bike fits me – in every conceivable way – like a perfectly tailored leather glove. I love it’s weight, its design, how I sit on it, and most of all, how fun it is to ride. I ride close to 365 days a year, rain, shine, snow, wind. It keeps me sane, it brings me joy. I rode today, here in Florida. While my legs felt great, and my destination (the beach!) perfect, I missed my ride. Stuck on a road bike with a stiff saddle, it just wasn’t the same. But getting out there felt good, and the fifteen miles I clocked helped with the extra cookies my grandma has been feeding me. Today’s innovator has spent a lot of her career shaping the way exercise is used for chronic disease management. Her innovation is mostly school-specific, and this nurse guesses, likely had a lot to do with the behind the scenes of our FLOTUS’ “Let’s Move!” campaign. My biking-running-swimming-yogi spirit says she’s definitely worthy of a Google Doodle. I spent a lot of my day outdoors, despite chillier temperatures, thanks to the Northern April snow showers. Most of it was on my sister’s bike, riding down the wide, flat, quiet roads of Southern Florida. It felt good to move, to sweat, but my mind missed the chaos of Manhattan’s streets, and my feet searched for my coaster break more than once, sad to rely on my hands to stop. Since buying my bike a year and a half ago, I’ve felt my life change in many ways. I initially purchased my NY-made cruiser because of a job I hoped to get that would require a cross-park commute ten times a week. The job fell through, but the biking stuck. I can honestly say, since I started riding, I feel less city-related stress, I sleep better, and I find more and more reasons to explore the tiny town most people call BIG. My bike spurs me to exercise – on and off it’s heavy frame. Exercise is more than commuting, though. A friend told me recently he plans to increase his biking around town; that would take care of his exercise needs. He never played sports growing up, and he doesn’t find much enjoyment in them as an adult. Running? Psh. No, I’ll just bike. For me, riding spares the stress of the underground, and hands me the joys of movement and air and freedom. But it is no evening run, or long swim. These efforts bring me mental clarity, break the chain of my thoughts, keep me in control amidst the constant din of the city. They have become a habit of my days, and when I miss them, I feel it. But I started early, swimming as a tiny girl, running as a high schooler. A lackluster performer, but a participant all the same. Today’s RN Innovator, Dr. Joanne Harrell, PhD, RN, FAAN, is a pioneer in exercise science in youngsters. Long before FLOTUS was touting “Let’s Move!” as her platform, Dr. Harrell was studying early-onset diabetes and heart disease in children, and the effects exercise played on both. With her interventions in the field, majorly supported by the National Institute of Nursing Research (NINR), we now have fitness and nutrition programs that are implemented in schools across the country. A focus on early intervention in school-based children, Dr. Harrell’s research has direct correlation to lower blood pressures, lower incidences of diabetes, and increased health knowledge. I’d imagine that this links directly to parents; when a kid comes home from school touting anti-tobacco facts and pro-exercise activities, it’s hard not to follow. And it makes sense — starting the understanding of exercise’s importance at a young age should last well into adulthood. I love what Michelle Obama is doing for children across the country. Her dancing videos are inspirational and hilarious (um, she can move). To start a new generation better off than the last, running one foot in front of the next, is fantastic.But I’d bet my two cents that Dr. Harrell’s innovation gave a lot to our first lady’s campaign — think of how many lives have been changed because of it! AKA: Google Doodle worthy.